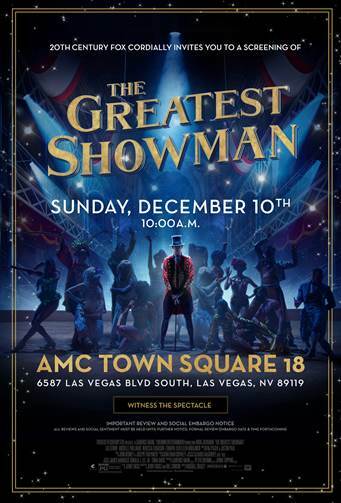 Enter For A Chance To Win Passes To See THE GREATEST SHOWMAN on December 10th at 10:00 AM in Las Vegas. At this screening guests will enjoy free popcorn and soda, free face painting, and a free photo booth themed to the movie. “The Greatest Showman” is directed by exciting new filmmaker, Michael Gracey, with songs by Academy Award winners Benj Pasek and Justin Paul (“La La Land”) and starring Academy Award nominee Hugh Jackman. Jackman is joined by Academy Award nominee Michelle Williams, Zendaya, Zac Efron and Rebecca Ferguson.